Janice Thompson ends her Backstage Pass series strong with book 3 "The Director's Cut." Tia has everything under control on the set, but she struggles with having her life under control. Tia's family is filled with drama and she is always in the midst of it, either by choice or she is coerced into helping various family members. Suddenly Tia finds herself attracted to Jason, a camera man, someone whom she often found herself at odds with; however things are changing between the two of them. There is much going on on the set as Kat is about to deliver her first baby, Tia's sister begins to work there and Erin, Tia's intern, is just who Tia needs and she may be the perfect match for Brock as well! I loved this series and although I was sad to finish the book and the end of the series, I thought Janice did an excellent job with wrapping everything up! I cannot wait to see what she comes out with next!!! This book and entire series drew me completely into the story and the characters' lives. The characters are people I would love to work with and be friends with. Their interactions are so real and so funny at times, I just wanted to keep on reading! This is a must-read series and an author I am hoping will write many more for us all to enjoy! 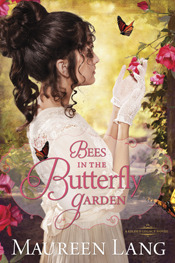 Maureen Lang’s “Bees in the Butterfly Garden” will immerse you in the lives of the rich and also the lives of those whom cheat the rich and those individuals caught in the midst of both lifestyles. Meg has grown up in the most elite boarding school; however she has always felt like she lacked her father’s love. Upon hearing of her father’s death, Meg bucks against the system of following rules that has been ingrained all of her life and begins to learn of her father’s life and why he kept her away all of her life. Ian, Meg’s father’s right hand man is caught between following the path of thievery and deception or breaking free of this style of life. It becomes more of a dilemma when Ian finds himself falling in love with Meg and wants what is best for her. Meg is determined to follow in her father’s footsteps and partner with some of her father’s old cohorts and so she spends the summer with a wealthy family under the pretense of designing a garden while in fact she is trying to find out where the family gold is hidden. Will Meg follow through with the plan or with the friendships that she builds. I was immediately drawn into the story and the characters’ lives and I did not want to stop reading! The characters were all well-developed and I loved the dynamics and relationships between the characters. Nelson, Claire and Evie would be my choice to spend a summer with and I enjoyed learning about their way of life back in the late 1800’s. Another aspect of the book that I loved are the etiquette rules that are included as headers for each of the chapters. These are additional ways to really bring the way of life alive for the readers and further immerse them into the setting of the story. This is a book filled with so much and is very well-written, truly not a book to be missed as you will be drawn in to the romance and suspense! Book Review - "Praying God's Word for Your Husband"
Kathi Lipp's "Praying God's Word for Your Husband," will sure to be an encouragement to you as it was to me. Filled with verses, personal stories from both Kathi and her husband, and sample prayers this book is a great resource to keep handy in times of needed help and encouragement. Lipp begins the book with discussing prayer in general and the importance of prayer and also devotes a chapter for those who have a husband who is not a believer. The second part of the book is split into chapters that address specific areas including money, work, feeling inadequate and relationships. This book is very user-friendly, and by this I mean if there is a specific area that is of struggle, it is easy to find guidance as to how to pray about this concern. Often it can be difficult to really say what you mean when praying and sort through what you are trying to say. This book will greatly help with that! Lipp is just so real in this book and I felt as if I was sitting with her relaxing and discussing our lives over cups of coffee. I wasn't sure what to expect when I received this book and I am pleased with the layout of the book and how well written it is! Diana Wallis Taylor's latest novel, "Mary Magdalene," brings to life a character from the Bible who has been judged and discussed for centuries. Mary is living a normal life with her parents whom love and adore her. One night Mary experiences an awful nightmare and this changes her life forever. Mary begins to suffer from seizures and terrors and is referred to as "Mad Mary." Throughout this Mary is supported by her husband and parents and she earnestly seeks healing from God. 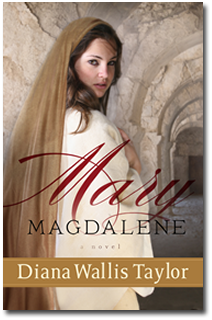 This is a well-written account of Mary Magdalene's life. I feel as if I did not know much about her, but Taylor has brought her to life for me! 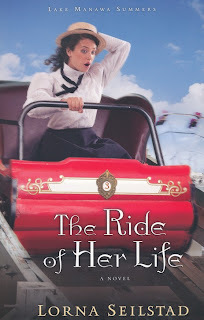 Taylor has such a gift for transporting the reader back in time through her descriptions and portrayals of scenery and the way of life along with bringing the characters to life. The relationship between Nathan and Mary is beautiful and it was easy to feel the love between them. I felt myself experiencing sadness, anger and happiness along with Mary throughout the story. This is an excellent book for anyone who wants to be swept back in time! Kay Warren's "Choose Joy: Because Happiness Isn't Enough" is sure to inspire you and lift your spirits! It is normal to feel happy at certain times of our lives, but it is so difficult to be happy at other times and at those times it is when it is so important to have joy in our lives. Split into four main parts, this book addresses joy in our lives, whether it be how we think, how we interact with others or choosing to live joyfully in our daily lives. Filled with Kay's personal thoughts and experiences as well as Bible verses and quotes, each chapter will leave you with much to think about and changes to make in your own life. I loved the layout of the book as it flowed so nicely and being that it is split into well-defined sections, it is a good book to carry with you and read a section when you have a few free minutes. My favorite page of the book is page 31 which reads, "Joy is the settled assurance that God is in control of all the details of my life, the quiet confidence that ultimately everything is going to be all right, and the determined choice to praise God in all things." This is a quote that after reading this book I am trying to live my life by. This is a great read for anyone who would like to feel more settled in this crazy world and live more joyfully day to day! If you read Eva Marie Everson's "Chasing Sunsets," then you must read her latest novel, "Waiting for Sunrise!" We were introduced to Patsy Milstrap in "Chasing Sunsets" and now she is back as the main character in "Waiting for Sunrise." Patsy and her husband Gil are on their way to Cedar Key for a must-needed vacation, but that is not all that awaits them. The book jumps back in time and we meet Patsy when she is a young girl, reaching the age of adolescence and the difficult decision her mother must make. Although, this decision was to protect her and Patsy had a good life with people who loved her, she has been unable to come to terms with everything that transpired. This baggage is very much a part of Patsy as she marries and begins a family and throws herself into the role of wife and mother. This is a well-written novel that is filled with lovable characters, heartache, family struggles and love. I did not want to put this book down once I began reading! I was immediately drawn into the story and the characters' lives. There were so many things going on at once, but yet I never felt lost or confused. I loved how the author wrote about Patsy and her brothers, their separate lives and then brought the two stories and the characters together. This is a very touching, emotional book that will leave you crying, smiling and thinking about these characters long after you finish reading! *****Would you like to win a Kindle Fire? Eva Marie Everson has tied in a Kindle Fire contest with the promotion of this book! Don't wait the deadline is tomorrow, June 16th!!! Go to http://www.evamarieeversonauthor.com/#!kindle-contest Good luck! Lorna Seilstad's Lake Manawa Summers series concludes with book 3, "The Ride of Her Life." Lilly, Marguerite's best friend and former maid, is trying to make it on her own with her young son, Levi. Having lost her husband in an accident, Lilly cannot stay with her controlling in-laws any longer. Lilly takes a job at a lunch counter and moves in with Emily and her infant daughter as she saves up money for a home to call her own as this is her one true desire. Lilly does not want to have another man in her life as she is still in love with Ben and does not want to love and trust again; however she cannot control her heart when she meets up with Nick Perrin. Nick weaves his way into Lilly and Levi's lives and hearts and Lilly struggles with trust, not only trusting Nick, but God as well. With her father-in-law making threats and trying anything he can to get his only heir back until his control, Lilly must learn to rely on God and face her fears and her heart desires. I have really enjoyed this series and am sad to see it end. It was great to be back in the lives of Marguerite and Trip, Emily and Carter and also learn more about old and new characters. This is an exciting book filled with romance, friendships, issues of trust and jealously and learning to really give it all to God. I would have loved to read another book about these characters, but since this is it I can imagine the lives they take from here. Lilly will finally have a home of her own with Nick making toys, and the three friends will continue to share their summers together with their families and added to their group will be Eugenia and Mark, Mark who will be a respected lawyer and Eugenia more self-confident and more adept in the kitchen. This book and entire series is a great way to kick off the summer! I am looking forward to new series and characters by Lorna Seilstad! Book Review - "Taste of Home Cooking School Cookbook"
Catherine M. Cassidy is Editor-in-Chief of Taste of Home. She is responsible for driving editorial direction and product strategy across the brand’s media platforms. They include Taste of Home, the number one food and entertaining magazine in the world; TasteofHome.com; social media; special interest publications; and cookbooks. She also is responsible for editorial direction for the magazines Simple & Delicious and Healthy Cooking and Enthusiast Brands Birds and Blooms, Country, Country Woman, Farm and Ranch Living, and Reminisce. Cassidy has toured the country as the face of Taste of Home for national and local TV, radio, and newspaper interviews in support of the best-selling Taste of Home products, including its cookbooks. Prior to joining Taste of Home, Cassidy served as Editor-in-Chief of Prevention magazine, at Rodale, Inc. Cassidy joined Rodale in 1986 as an associate editor in the book division, and was later named Executive Editor of Rodale’s Custom Publishing division. She started her career at Runner’s World and Fit magazines in Mountain View, California. Cassidy lives in Mequon, Wisconsin, with her husband and two daughters. I have always been a fan of Taste of Home magazines ever since my mother subscribed to them years ago; therefore I was thrilled to have the opportunity to review the Taste of Home Cooking School Cookbook! I love trying out new recipes; however some can be intimidating as they include ingredients I have never used before or a cooking style or technique that I am unfamiliar with. This cookbook included step by step instructions and tips for trying out new techniques! For example, I have never made stuffed burgers, but they sound so appealing to me to try, and there are instructions for this. Another thing that is included is steps for halving a chicken. The recipes are a great range of easy, simple recipes to more time consuming and "for company" and entertaining recipes. The cookbook is also filled with beautiful, colorful pictures of the recipes and I love looking through this and picking out recipes to try! I have made the Baked Ziti that is on page 187, this was an easy recipe and so delicious! I have a long list of recipes to try in the upcoming weeks! This is a must-have cookbook for every home as it is filled with a wide variety of recipes, filled with pictures of the foods and jam-packed with tips and advice!